SNIPPETSON (AUS) (Bay 2001-Stud 2006). 4 wins to 1400m, STC Eskimo Prince H., L. Sire of 516 rnrs, 321 wnrs, 11 SW, inc. My Poppette (Moonee Valley Fillies Classic, Gr.2), Fast Clip, (Our) Vergara, Snippets Land, That's the One, Rebelson, Nobby Snip - Fun Tapestry (H.K. ), Mystic Master, Lady Sniper, Miss Upstart, Mister Milton, SP Bangs, Fuerza, Snipzu, Hot Snippety, Charge Ahead, Admiral Rous, Dansonate, Kenjorwood, Anythingthatmoves, etc. Couldn't Agreemore (g. by Not a Single Doubt). 6 wins to 1300m, A$219,635, VRC Dean Palmby & Scott Millson H., SAJC Hyland Race Colours H., Tattsbet H., 2d SAJC HC Nitschke S., L, MRC Pink Ribbon Cup, SAJC Junction Cup Lunch 2YO P., Schweppes H., Audi Solitaire H., 3d VRC Bob Hoysted H., L, 3AW Community Raceday H.
Big on Bling (f. by Not a Single Doubt). Winner at 1050m, SAJC Schweppes P.
One Short (g. by Snippetson). Winner. See below. Green Lantern (g. by Charge Forward). 7 wins to 1250m in Aust. Verna's Punt (f. by Duke of Marmalade). 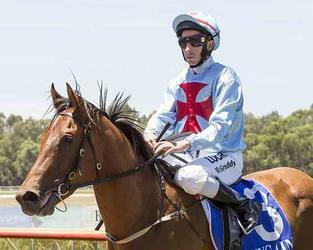 3 wins at 1200m in Aust. First Among Equals. 5 wins at 1000m, 1400m, HK$4,330,050, HKJC Lek Yuen H., River Verdon H., John Peel H., Sichuan H., Chevalier Construction H., 2d Hong Kong Racehorse Owners Association Trophy-twice, HKJC Lung Kong H., Peak H., Chevalier Construction H., 3d HKJC North Point H., Clear Water Bay H., Heilongjiang H., 3D Gold Cup H.
Swanz. 3 wins to 1400m, A$104,555, MRC Valley of Georgia H., 2d MRC Avon H., MVRC CFMEU & FFTS H., MRC Dantelah H., 3d MVRC Members Equity Bank P., MRC Robert Smerdon H.
Blumarju. 2 wins. See above. Flo Jo. Winner at 2, 2d ARC Graeme Thomson Antique & Estate Jewellery H., Waipuna Hotel H., 4th Whangarei RC Northland Breeders' S., L.
Weepinbell (Alydeed). 9 wins-2 at 2-from 6f to 8½f, 2d Hastings Park Ascot Graduation S., L.
RONALDO (Dehere). 2 wins at 1800m, 2000m in India, Bombay CN Wadia Gold Cup, L, 2d Poona General Rajendrasinhji Million, L, 3d Poona Derby, L.
Absolute Pleasure (Gaswar). 5 wins at 1100m, 1200m in India, 3d Bangalore Winter Million, L.
DARREL (Distant Relative). 17 wins-2 at 2-from 1400m to 2800m, €299,318, 49,894,934L., Rome Premio Roma Vecchia, L, Handicap d'Autunno, Premio Foro Italico, 2d Rome Premio Carlo d'Alessio, Gr.2. MIDNIGHT LUTE (Real Quiet). Champion Sprinter in USA in 2007. 6 wins-1 at 2-at 6f, 7f, US$2,690,600, Saratoga Forego S., Gr.1, Breeders' Cup Sprint S., Gr.1-twice, Keeneland Perryville S., Gr.3, 1400m-in track record time, Del Mar Allowance, 2d Aqueduct Cigar Mile H., Gr.1, Santa Anita San Fernando S., Gr.2, 3d Santa Anita Malibu S., Gr.1, 4th Keeneland Commonwealth S., Gr.2, Santa Anita Strub S., Gr.2. Sire. Captain Cherokee (Sir Cherokee). 4 wins from 6f to 8½f, US$361,845, Churchill Downs Allowance, 2d Santa Anita Palos Verdes S., Gr.2, San Carlos H., Gr.2, Potrero Grande H., Gr.2. Socialbug (Curlin). 3 wins at 6f, 6½f, Santa Anita Allowance, 2d Churchill Downs Winning Colors S., Gr.3. Tusculum Rd (Gilded Time). Winner at 2, 3d Delaware Park White Clay Creek S., L.
Crushed Velvet (Malibu Moon). Winner at 2, 3d Santa Anita Santa Ynez S., Gr.2. Brinkley (City Zip). 2 wins at 5f, 5½f in 2016, Keeneland Allowance, 3d Saratoga Coronation Cup, L.
Race Record: 8 Starts 1-2-1 A$46,350. Winner at 2 in 2015-16, 2d WATC $5 Early Bird Admission P., LWP Property Group P., 3d WATC Jim Chadwick 80th Birthday 2YO P.